Cooking the perfect pork chop is not easy. One false move can lead to a dry piece of meat that is as tough as leather. Fortunately, Chef Tiffany Derry has some tips to help us cook the perfect pork chop. Derry began her culinary career at age of fifteen as a server in a restaurant. By age seventeen, she promoted was to a management position. After high school, Derry attended the Art Institute of Houston followed by stints in esteemed kitchens throughout Houston and Dallas. In 2011, Derry teamed with Patrick Halbert of the Halstin Group to open Private|Social in Dallas. Derry gained national attention when she appeared on Season 7 of Bravo’s Top Chef where she was voted “fan favorite.” She was also a finalist on Top Chef: All- Stars and a series host on Spike TV’s, Hungry Investors. But Derry’s greatest passion is helping home cooks to prepare delicious, healthy meals. When it comes to pork, Derry likes to start with lean cuts of meat such New York, ribeye, and porterhouse pork chops. She also recommends using spice rubs or fat-free marinades or juice to add additional flavor without adding extra fat. Derry’s favorite pork chop recipe, Sugar & Spice New York Pork Chops, is full of bold flavors, low-fat, and requires minimum prep time. Follow the directions below and you’ll be making the perfect pork chop in no time. Set the grill to medium-high heat (about 450 degrees F). Mix all 2 teaspoons of sweet paprika, 2 teaspoons of brown sugar (light) and 1 ½ teaspoons of coarse salt in a small bowl. Rub all sides of pork chops with spice mixture. Let stand 15 to 30 minutes. Grill chops over direct heat until the internal temperature reaches between 145 degrees F and 160 degrees F. Use a meat thermometer to check internal temperature. Grill the pork chops for 4 to 5 minutes on each side. 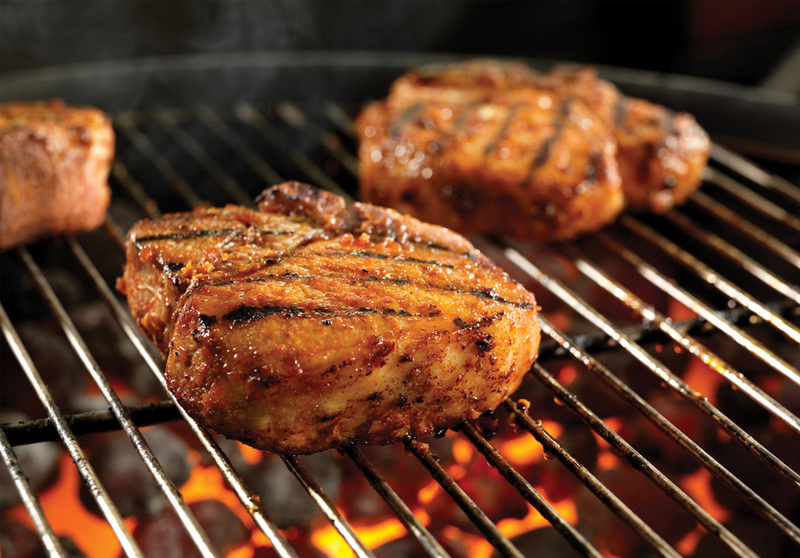 Remove the pork chops from the grill and let them rest for 3 minutes. This recipe serves four and has only 250 calories and 7 grams of fat per serving.